Thanks yours 27th.ult. with enclosure of letter from Cameron Shipp. Too bad he was unable to handle your book, am sure he would have done a great job on it. However, there are a few	more you can contact which I'll give you the data on later. The deal with Dr. Henderson sounds wonderful Betty, its a perfect opportunity for you, just made to order. Certainly is strange how things work out - well its about time you got a break & a chance to get ahead, you've tried hard for a long time & fully deserve lots of luck & success & I think this is IT Betty - congratulations! It sure was nice of your Uncle to make you a present of his old car for Xmas (you did'nt say that, but thats what I'm thinking!, he probably could'nt get a hundred & a half in trade for a '50 model, regardless of how well it runs & has been taken care of. I can only get three hundred in trade on a Mercury - just run 17000 miles, (since I bought it, we made two trips to Europe - hence the low mileage, so its practically a new car, & will last a long tine yet with the little use it gets now. I guess you have seen the insurance Dr. by now, hope that business will soon be cleared up, they sure drag these settlement cases & wear you down. I think you can reach Gene Fowler through the VIKING Book Publishing Co. New York - do'nt think you'll need any further address. There is also Robert Lewis Taylor you could contact at Doubleday Co. Inc. Garden City. N.Y. he did the W.C.Fields book. Another one is Kyle Crichton who wrote the Marx Bros Story, he is also with Doubleday Co. maybe one of these would be at liberty - all good writers. Well, have to go now, have a date with the Therapist, am taking treatments there twice a week, also getting allergy shots a couple of times a week & my own Dr once a week for check up & vitamin shot, all this & my Insulin shot every day I feel like a waffle!. Bye Betty, Eda joins in all the best to Wayne & self. Wish you big success in your new venture. Sorry Dear for delay in answering your letters - reason is I haven't been feeling too good - have been having attacks of headaches & sneezing for several months - have been having all kinds of medical examinations trying to find out the cause - went into hospital a couple of days to have my spine punctured to test the fluid etc. had exray made later for Sinus but they found nothing wrong - finally they made allergy test & found I was alergic to Dust, so am now taking shots twice a week - I think they are helping me a bit - but still have a little headache but not as often & violent as they were & I don't sneeze so much as I did - it sure had me worried for a while. On top of this my partner had to get a stroke which upset me very much - poor chap, he really is having a bad time, his was more severe than mine, besides being paralysed on his right side, it also affected his speech & is unable to move or talk - what a tragedy! I saw him last week for the first time - felt terrible to see him in the condition - he is still in bed & has two male nurses day & night. Note re the price of coal - that's shocking & now this petrol ration business is going to cause a lot hardship & discomfort for you all - it sure is discouraging to have to face austerity again for a while, but after we hear about the poor Hungarians & what they are suffering, I guess we should consider ourselves very fortunate - what a mess the whole world is in, I hope & pray war can be avoided - God help us. Not much to tell you Trixie. Lots of love & kind thoughts & wish you a very Merry Xmas - Happy New year - lots of good luck - health & happiness in '57. Thanks for the lovely card dear. Yes, these forest fires out here are pretty serious, especially towards the end of summer when everything is dried up & it always seems when one gets started - the wind starts blowing a gale which makes it very difficult for the firemen to control - I undertand an Indian kid started the last one near San Diego where eleven firemen lost their lives, he's in custody & confessed to setting off the brush fire, but being just a kid there's not much can be done about it I guess. Note you just turned 30 - I was born in June 1890. Went to see Babe last Friday—still in bed and unable to move or talk. I really felt bad about it. Nothing you can do or say in these situations. Glad to know you're out of hospital & back home again but sorry to note re the kidney trouble, that can be very painful - had a little experience with that myself. Anyway, pleased you are feeling better & got some of your weight back. I think the symptoms of change of life are headaches & fever running to a high of 103 for a couple of weeks, causing non-specific virus & digestive spasms, which no medicine or drugs are administered due to the virus not being of bacterial nature. Then, after the headache & virus situation has run the gamut, it seems the kidneys want to get into the act & try to top the whole show, this I understand is known as Change of Life! From what you tell me, it sounds like you really got it!, come to think of it, maybe I have it too. Thanks for the Xmas Card, I got a big kick out of it - think Ben would have too. I thought the caricature resembled Alice Cooke (Alice & Baldy) so sent it on to her for a laugh. Went to see Babe last Friday, still in bed & unable to move or talk, I really felt bad about it, nothing you can do or say in these situations, poor Lucille did'nt look too good herself, wan & tired, she must be going through hell with all this trouble - sold the home & moving into her mother's place next Wednesday, she has had to pack all the belongings into boxes etc. all by herself & the big worry is, she has'nt told Babe yet what is going on, afraid it would upset him & set him back. I certainly hope he will realise & accept the situation when she finally has to explain. On top of all this, Babe's ex, Myrtle, through Warchetti, started suit for back alimony due in the amount of 52000 Dollars - can you imagine, at a time like this, Babe of course does'nt know about it, the suit has been filed & one attempt was made to serve papers to Babe personally, but I understand Ben accepted them instead - what a tragedy the whole thing has turned out to be. Thanks for the news clippings from Vinepeg, note re the L&H salt & pepper shaker, thought you'd seen them before - I have a set, they're made in England & have been on the market for over 30 years & sold all over the World - another thing we never got a dime for! everybody makes money on us, but us. I still have slight headaches, but not so frequent or violent since I had the spinal examination, they found nothing there to blame the trouble on, so they still think it may be due to an allergy which I am still taking shots for. Note you got my letter forwarded from San Francisco, did you get the one I sent to the Hospital? Well, think that's the lot for now Ernie, so Eda joins in love and every good wish for a very merry Xmas & a Happy New Year, hope '57 will bring you lots of good luck, health & happiness. 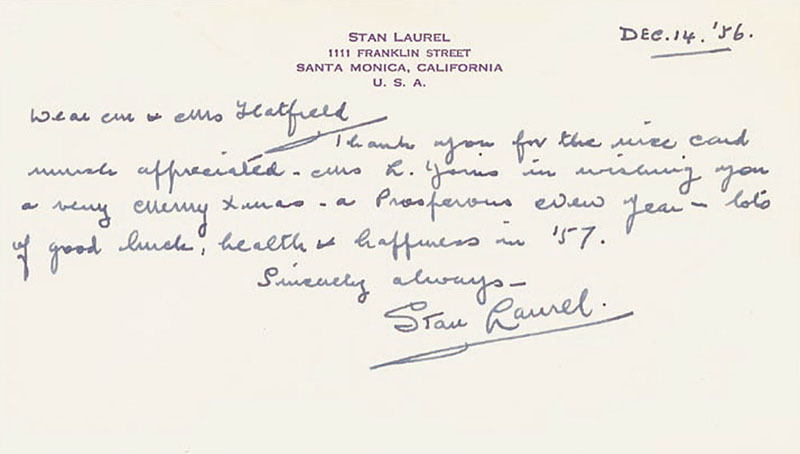 Even though Ernie Murphy worked for my Dad as a personal secretary at the Hal Roach Studio, he wasn’t responsible for writing a lot of correspondence. If my Dad couldn’t get to the phone because he was shooting, he would have Ernie make calls or write letters for him. He also did all of his banking. Thank you for the nice card much appreciated - Mrs L. joins in wishing you a very Merry Xmas - a prosperous New Year - lots of good luck, health & happiness in '57. Very many thanks for the lovely gift, it was certainly very gracious & sweet of you. 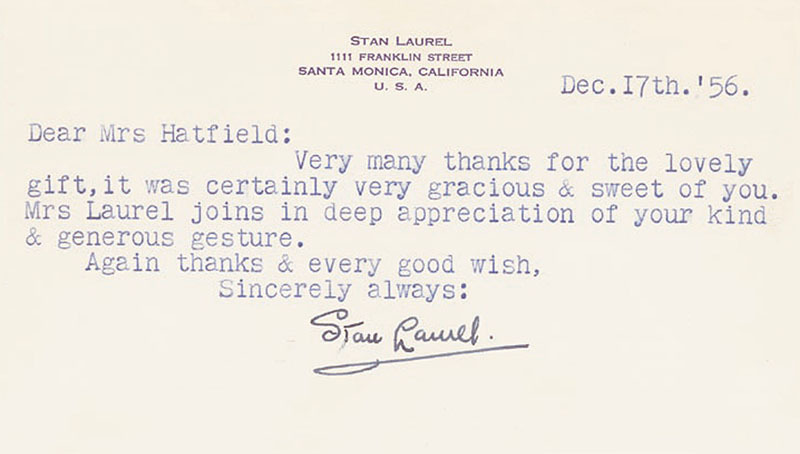 Mrs Laurel joins in deep appreciation of your kind & generous gesture. Thanks card. Eda's brother Mark passed away last night without any warning (heart attack) a great shock to us all - poor Eda is taking it hard - a tragedy for her. Will write later when things get settled. Sorry delay in answer to yours 5th.inst., intended to do so last week but Eda's Brother died suddenly last Monday night (17th.) & poor Eda took it pretty hard, she was so devoted to him it was a great tragedy to her. The funeral was on Wednesday & that night Charlie Rogers called to offer his sympathy & said he would drop by next day to see us, I do'nt know if he came or not as I had to go to the Dr that afternoon. Anyway, on Friday AM I got the news that Charlie yes dead! killed in his car, understand he was going home Thursday night about 11-30 PM over Laurel Canyon & ran off the road - brakes slipped or something. You can imagine what a shock this was right on top of the other, am terribly upset with the sudden happenings, just can't get over it. Due to all this, I'll answer your letter later on when things get calmed down, know you understand. Many thanks for your nice card this AM, appreciate the kind thought. Eda joins in every good wish to Wayne & self for a very Merry Xmas, prosperous New Year, lots of good luck, health & happiness in '57.